The 2019 F-lite – ultra light flight deck packed with all great features. The Crazyfly Up foil is a full carbon allround freeride foil suitable for beginners and intermediate riders. It offers high maneuverability, medium top speed and great stability. Plus the larger 580 squared centimeter surface area and hydrodynamic high lift shape of the front wing push up at low speed. It is easy to get up and fun to cruise. The larger front wing makes up for a smooth ride and is easy to ride strapless. More advanced riders will appreciate the larger front wing when landing their first jumps, as it is more much stable and easier to get back up on the foil than the smaller front wings. The rear wing has a more loose shape, allowing for playful turns and fun in waves. All parts of the foil set can be quickly and easily mounted and dismounted with only seven screws, which makes it perfect for travelling. We designed the foils with a modular system so all individual parts are compatible and interchangable between both the Master and Up foil sets. The modular system is ideal for upgrading your foil game. For example, you can upgrade your Up foil set with a Master Freerace front wing once you progress to hit higher top speeds. 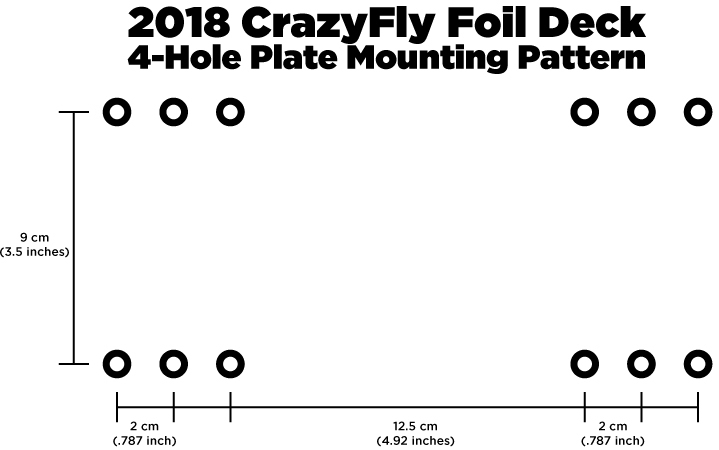 The Crazyfly Up Foil is made with the most advanced composite technology – prepreg Autoclave. Prepreg carbon fiber composites always have the perfect ratio of resin spread evenly and create the best molecular bonding. Prepreg composite lamination is a dry process, as prepreg carbon fiber composites are stored cold. Then they are CNC knife cut and hand placed into the mold. The Autoclave ensures correct pressure and heat are applied for a very specific time frame. This results in by far the best strength to weight ratio which is essential for high performance foils. Of course, all foil products are produced in Europe. This shape is a mixture of Delta and Bow shapes taking advantages of both. It offers lots of depower and boosting power on demand, automatic relaunch and maximum airtime. The Delta Bow shape is easy to control with low to medium bar pressure. This shape is ideal for riders looking for powered freeriding, big air jumps and hooked in freestyle. This kite is hyped up. High performance. Big confidence. Power. Muscle. No hassle. Emotion. Devotion. Addiction. Perfection. Pure power. Rush hour. Meet the long awaited king of the air. This rocket launcher of a kite takes you to the moon and back. From zero to hero. In split seconds. No jokes. It delivers. With the strongest 5 strut kite frame we have ever made, the Hyper is rock solid. No fuzz in the air, just pure lift, glide and smooth touch down. With Triplex Ripstop, it pulls. It pulls a lot, like a train. Extremely light bar pressure gives power on demand and ultimate control for this big air boosting kiteloop machine. It turns fast, on a dime, oh my. High aspect, no respect. Pull to play, accelerate. Oh damn, hit the break, Load up, get high. Let fly. Come down. Retry. The 2019 Hyper – Go big or go home.